Etihad Airways has partnered up with Australia’s flybuys customer loyalty program allowing shoppers to accrue and redeem air miles on its international flights. The partnership is the first time the flybuys program has had an airlines partner since the demise of Ansett in 2001. Under the new partnership, flybuys members can collect points when booking Etihad Airways flights, and will also earn Etihad Guest Tier Miles if they link their flybuys and guest miles accounts across Coles supermarkets, Coles Online, Liquorland and First Choice Liquor Stores.One Etihad Guest Tier Mile will equate to every $1 spent and is capped at up to 2500 miles per month. Shoppers also get the opportunity to collect Flybuys points and convert these to guest miles. In addition, as part of the initial celebrations, flybuys members are being offered up to 25 per cent of all economy and business class fares to anywhere in the world until 4 December, as well as five flybuys points per $1 spent on Etihad flights by booking through the dedicated flybuys ‘My Offers’page. Linked program members will earn three Etihad Guest Tier Miles for every $1 spent in Coles, Liquorland and First Choice capped at 5000 per month until 31 December. There are also prizes on offer for those who link the two programs, including round trip economy class flights for two, and tickets to an A-League game in Melbourne or Sydney. 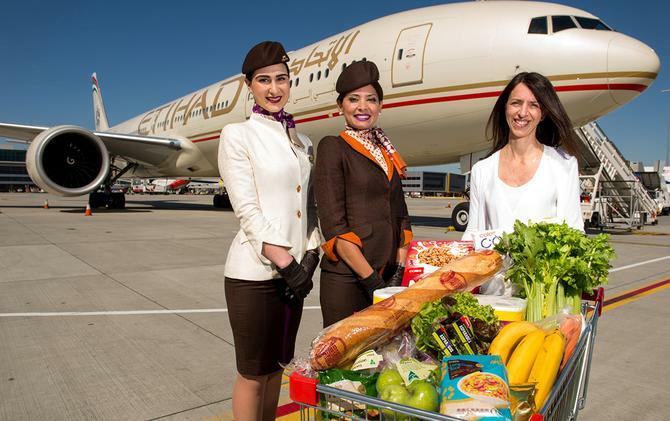 Etihad Airways chief commercial officer, Peter Baumgartner, said the launch of the partnership was significant for the millions of flybuys members across Australia. “Together, we are offering flybuys members the unique ability to earn Tier Miles in the Etihad Guest program and as a result, to enjoy the exclusive benefits we offer our most valuable frequent flyers,” he said. Coles general manager for flybuys, Adam Story, was also excited about the partnership and opportunity to help members accelerate their Etihad Guest frequent flyer status. “We are proud to be offering our members the opportunity to collect flybuys points quicker and redeem them on exciting rewards like international travel,” he said. The Etihad Guest customer loyalty program launched in 2006 and now has more than 3.5 million members globally. It covers not just Etihad but also partner airlines including Virgin Australia. The flybuys program was fully acquired by Coles parent company, Wesfarmers, in 2011 and relaunched under the Coles mantle in 2012.It has more than 7 million active members. Are customer loyalty programs stuck in the past?